pH was very low again. Below 6.0. Added four teaspoons of lime to bring up the pH. Also added two teaspoons of kelp extract and one teaspoon of chelated iron. A couple of weeks ago, I dosed this grapefruit tree with chelated iron. The leaves look a bit darker now. These trees are slightly darker green after the calcium dosing. But still not looking great. 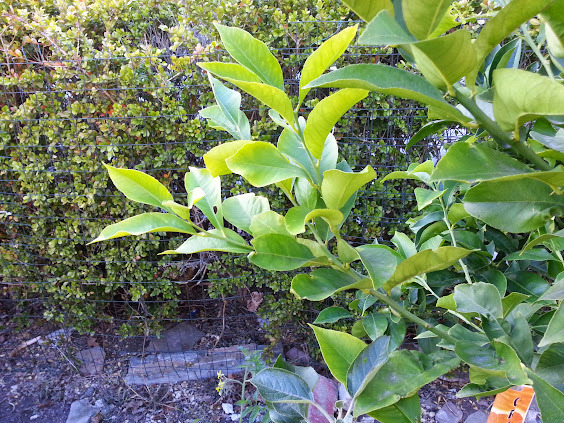 Adding one teaspoon of kelp extract with a gallon of water to the citrus and elderberry trees. This is how the trees look today.